The view from the water mirror is certainly the best known of the Château d'Azay. Honoré de Balzac said it was like "a faceted diamond set in the Indre". From this point of view, the château reveals the shape desired by Gilles Berthelot: both a modern mansion with its large bay windows and tall dormers, and imposing with its machicolations, reminiscent of the rampart walks of mediaeval fortresses. 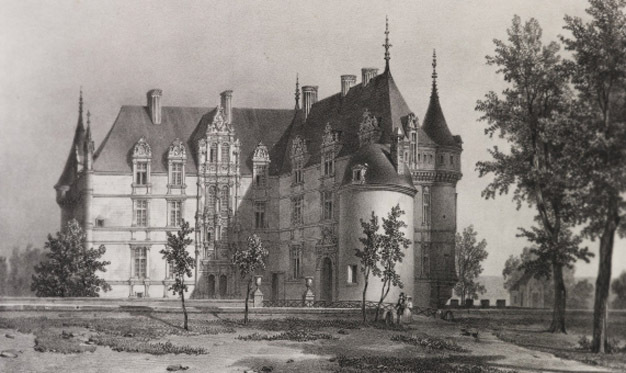 However, the château owes its beautiful stylistic unity to the work of the Biencourt, who in the nineteenth century, completed the wing by adding a corbelled tower. The famous water mirror is partly an invention of the twentieth century. In the previous century, a terrace ran alongside the south wing. It was only in 1950 that the branch of the river was expanded so that water bordered the foundations of the château: the work had the effect of slowing down the flow: ever since then the château has been reflected in a water mirror. This corbelled corner tower dates from 1856. 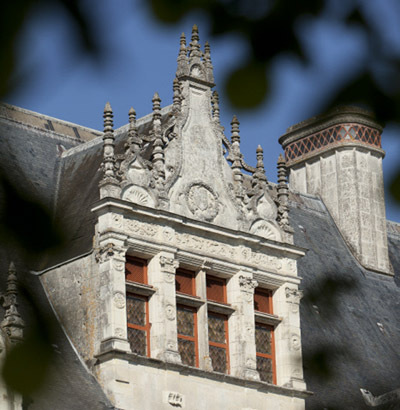 Previously, the Biencourt had built a "troubadour" turret here, with a Gothic silhouette, and a small Chinese pavilion, reflecting the fashion of the time. This new turret unifies the appearance of the château, which by the work done in the 19th-century became the perfect example of Renaissance architecture. 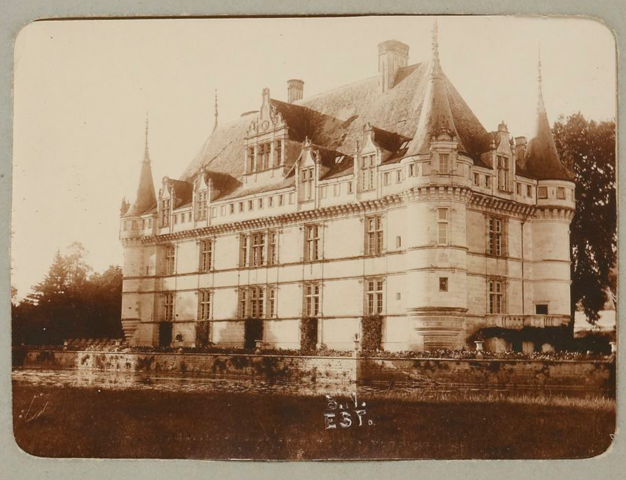 Château d'Azay-le-Rideau around the 2nd quarter of the 19th-century. Just below the high roof, machicolations on corbelling form a rampart walk. Without military utility, it serves only as a symbolic architectural element that places the château of Gilles Berthelot in the continuity of French fortresses, and therefore a certain representation of power. > Discover the "salon Biencourt"